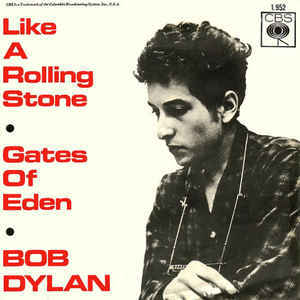 This was the song that heralded the Dylan Goes Electric era, and when he first played it live at the 1965 Newport Music Festival, he was met with boos and charges that he’d sold out, or was somehow a “traitor” to his folk roots. 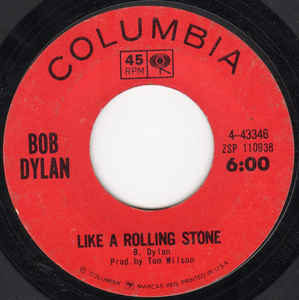 But Bob Dylan stuck to his guns, and “Like a Rolling Stone” became, and remains, his biggest single ever. This is the picture sleeve of the 45. If it hadn’t been for a quartet from Liverpool and their obvious cry for Help!, it probably would have gone all the way to Number One on the Billboard chart. This podcast has the ability to spread through your ratings and reviews, so please take the time to go to iTunes, or Castbox, or whatever you use for your podcasts, and leave me some love. But the real fun lies here: you can play with the original video on your own by clicking on this link. I will refund every dime of your money if you don’t think this is cool. This was the A side of the record, remember. This week we’re taking a look at a song that was never meant to be a hit. 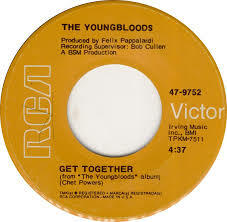 In fact, it wouldn’t even have appeared on a record if some musicians hadn’t been hanging around when someone realized that the record he’d been working on didn’t have a B side. 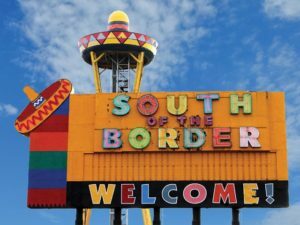 So he rounded up whomever he could find and fortunately, the saxophone player had a tune he’d been fooling around with for a little while, plus he had a fondness for a certain beverage from South of the Border. Erm…no. The one Down Mexico Way. Truth be told, if you have podcast software I’d prefer you got it from there; it helps me keep better track of listener stats. And of course, if you’re so inclined, please leave a review on your favorite podcast software. Thanks so much for your support! For the record: non-episode-based posts are going to have dopey titles. I’ve been doing it over at Baltimore Diary forever, and I’m going to do it here, because it amuses me and the sooner you accept it, the better off everyone will be. Mmkay? This week’s episode was inspired by an old high school friend by the name of Kevin, who actually asked me to do a podcast about the song Crackerbox Palace, which also appears on George Harrison’s album Thirty-Three and 1/3. I did the due diligence as far as researching it, and while there is a little bit of a story behind it, it wasn’t really enough for an entire podcast, so I figured I’d save it for here. In 1975, George was at the Midem Music Festival, which is a trade show that’s been held in Cannes, France, every year since 1967. At the festival, he met up with a man named George Greif. Harrison remarked that Greif reminded him of the late comedian Lord Buckley (seen here at left). Coincidentally, Greif had been Buckley’s manager back in the day, and he invited George to come visit him at Buckley’s home in Los Angeles, which he referred to as “Crackerbox Palace”. 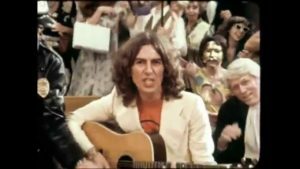 Also of note is that, in addition to the “This Song” promotional film, George made one out of “Crackerbox Palace” as well, which also aired during the November 20, 1976 episode of Saturday Night Live. If you catch the re-run that’s been cut to an hour, though, this one usually gets cut based on the time considerations. It’s also pretty whimsical, though not as obviously comedic as “This Song”. 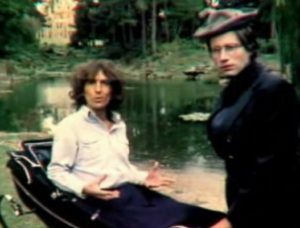 Directed by Eric Idle, it features future Rutle Neil Innes as the nanny (above, right) and agai his future wife Olivia appears briefly in the bedroom shot (on the left). And while it wasn’t shot at Buckley’s house, it was shot at Friar Park, George’s home from 1970 until his death in 2001. Some have said that he occasionally referred to Friar Park as “Crackerbox Palace,” but I haven’t been able to nail that one down for sure. Here’s the video. And if you’re curious, the answer is Yes: George did lift that “It’s twoo, it’s twoo” from Blazing Saddles. This week the podcast visited a chunk of George Harrison’s life, specifically the aftermath of the copyright infringement lawsuit surrounding “My Sweet Lord” and the tune inspired by the suit, titled “This Song”. 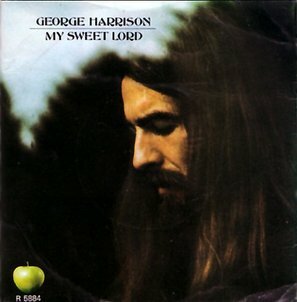 With regard to “My Sweet Lord,” someone commented, “I always did like the black gospel singers singing “Hare Krishna”. Most of them probably had no idea what they were saying.” And he’s at least partially right. If listeners weren’t listening too closely, they may not have realized that the backup singers were singing “Hare Krishna”, in part because for the first couple of verses, they sing “Hallelujah”. It’s certainly possible that they stopped listening too closely after that point. I offer homage to my guru, who is as great as the creator Brahma, the maintainer Vishnu, the destroyer Shiva, and who is the very energy of God. It’s one of fourteen verses of a hymn praising Hindu teachers. But there’s another element to the backup singers that you may find surprising: it’s not a Gospel group singing. Now, on the Billy Preston version, it’s absolutely a Gospel group. As I noted on the podcast, those are the Edwin Hawkins Singers, who had a hit of their own with “Oh Happy Day”, and had also just been noted for singing backup for Melanie on her breakout hit “Lay Down (Candles in the Rain).” So who’s providing the backup voices for “My Sweet Lord”? They’re all George Harrison, hence the credit on the album sleeve to “the George O’Hara-Smith Singers”! This is the original sleeve that the record came in. I still have mine, though not quite in this condition. In the mid 1970s, George Harrison was having a rough time of it. He was still embroiled in the lawsuit over “My Sweet Lord”, he was tangled up in other legal issues caused by his breakup with his business manager, his album Extra Texture had taken a beating by the critics, and to top it all off, while recording Thirty Three and 1/3 he was struck with hepatitis and couldn’t work for most of the summer of 1976. A still from the promotional film (they weren’t calling them “videos” yet) for This Song, from near the end. If you look closely you can see that George’s playing hand is cuffed to the cop, played by Harry Nilsson. But he managed to turn it around with the release of this, the first single off the album. It didn’t exactly tear up the charts (it peaked at #25 on the Hot 100), but it did remind us all that George was still around and could still bring it when he wanted to. This episode was inspired by a suggestion by a friend of mine, who originally asked me to write about a different song that appears on the same album. It turns out that the story behind that song is quite short, not long enough for a full podcast, so I’m saving it for a post you’ll see in a couple of days. As promised, here’s the video. So tell me: who can you identify? And is that vampiric-looking prosecutor really Michael Richards? It’s been great to get the positive feedback and such from you folks in the few short weeks since How Good It Is first launched. I made those first few before the official launch date, so I was working in a bit of a vacuum. And when it comes to stuff like this, I’m my own harshest critic. Back in my Radio Days I was known for doing dozens of takes before finally going back and deciding that Take 17 was “eh, good enough”. One of my brothers has been listening regularly and is probably my second-toughest critic. But he invariably raises good points so I can’t fault him for it. He told me that he’s actively looking for a song (by a specific artist) for me to do a show about. My other brother, I don’t know if he’s been listening, but that’s OK. I’m pretty sure my wife doesn’t listen, either. Or my father, or my sisters, or my daughters, or…you get the picture. Anyway, this post is actually in response to some feedback I’d received. 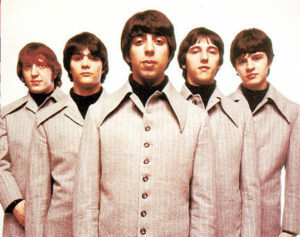 During Episode 1 I noted that the song “I’m Not In Love” by 10cc peaked at Number 2 on the Billboard Hot 100 Chart, and that in each of the three weeks it spent in that position, there was a different #1 song. Someone in the Land of Social Media asked me, “So what are those three songs?” You took the time to listen, so I took the time to look it up. 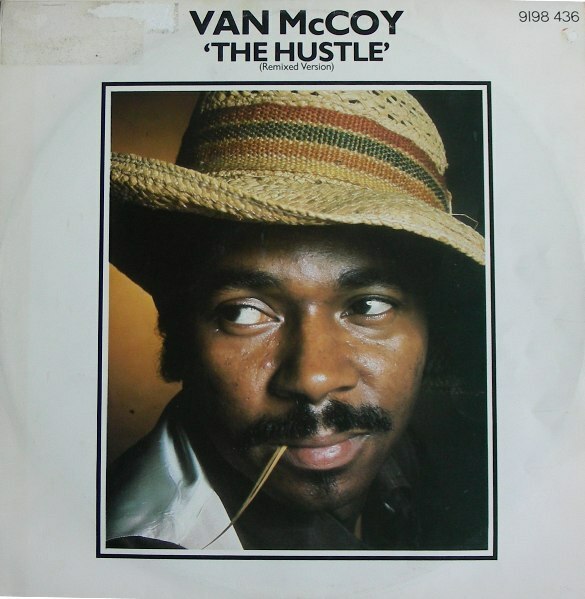 When it first reached #2 the week of July 26, 1975, the #1 song was “The Hustle” by Van McCoy. 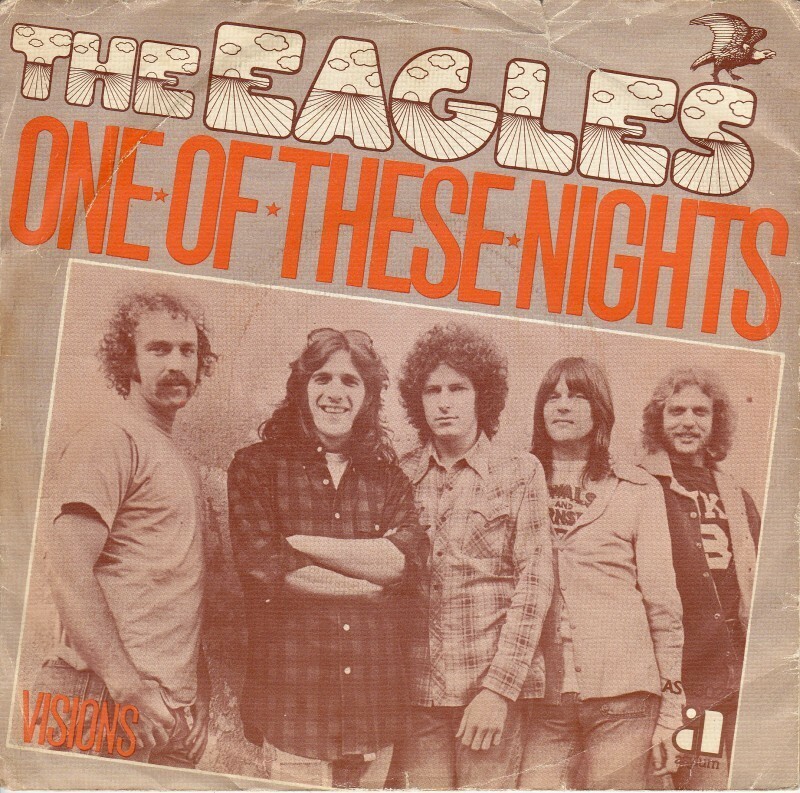 For the week of August 2, 1975, The Eagles’ “One of These Nights” was at #1. 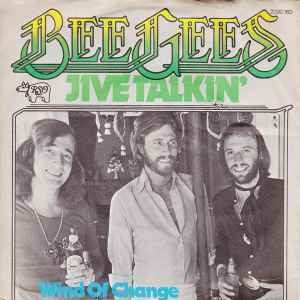 Finally, on my oldest daughter’s (negative seventeenth) birthday, it was “Jive Talkin'” by the Bee Gees. As a 12-year-old, I was pretty immersed in pop music and I’d look at the Top 20 chart that was published in Long Island’s Newsday every week. I kind of remember that summer being one in which the charts churned a lot of change from week to week. So remaining in one position, even if it was #2, for several weeks, was still a bit of an event. 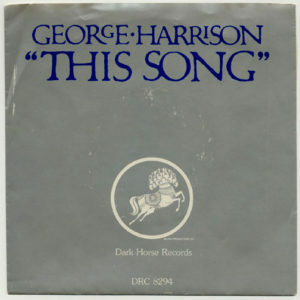 Next week we dive into a solo single by one of the Beatles. Wait, Phil Collins did what? He drowned a guy? Uh…no. He humiliated a coward? No. He shamed someone from his childhood? Also, no. Many stories swirl around the meaning of Phil Collins’ breakout hit from 1981, and so many of them aren’t true. 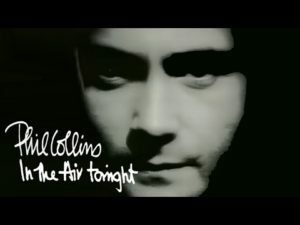 Collins was in a world of hurt following the breakup of his first marriage, and he channeled a lot of that energy into writing the Face Value album. This week I go into that a little bit (but only a little bit; it gets kind of tawdry), plus I talk about the sound that makes him instantly recognizable on so many records in the 1980s. And it’s a sound that’s making its way back into popular music these days. 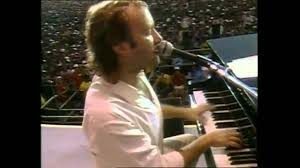 Phil Collins during his appearance at JFK Stadium in Philadelphia during Live Aid. This particular still is from his performance of “Against All Odds”. With all the changes in the weather we’ve been having, it’s been playing havoc with my voice. So if I don’t sound quite right, there’s a reason for it. Here’s hoping I sound a little better next week. Also: for those of you not in the know, that weird squeaky noise you hear during the Peter Gabriel clip isn’t evidence that I use a cheap office chair, although it’s true, I do. That sound is part of the Gabriel song. And of course, I wouldn’t be especially upset if you went to iTunes and gave me a positive review. Even if that’s not your podcast catcher, every time someone says something nice about me in iTunes, an angel gets his wings. 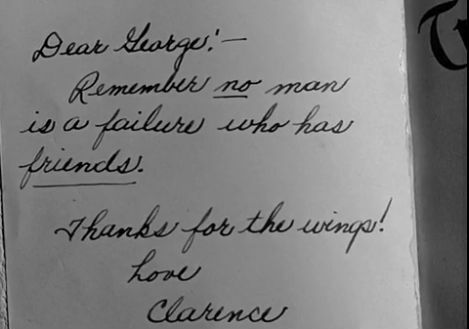 Right, Clarence? This is a great video from Vox.com that explains the concept of gated reverb in greater detail. Article from the Miami Herald from last year about Phil Collins finally opening up to the story behind the song. But naturally, his ex is going to speak her piece. See? Tawdry. I wasn’t kidding about Ozzy Osbourne. 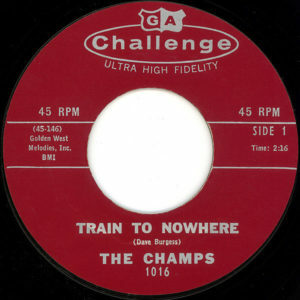 One of several labels used for the 45 of this song. I think this was the retail version of the original release, based on what the promo label looks like. Chester (“Chet”) Powers was a musician who was well-known in the café scenes on both coasts, and certainly had his influence on other musicians. He’s also known for being a member of the band Quicksilver Messenger Service. But for all that, he only wrote one song that was any kind of a commercial success, and that was after a virtual parade of artists had already recorded it. Coincidentally (because I’m terrible at planning ahead), I’m typing this post on Thursday evening, September 7. Today happens to be Dan Ingram’s 83rd birthday. Happy Birthday, Big Dan! 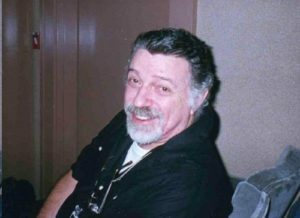 Musicradio77.com is a collection of stories, photos, airchecks and other goodies for anyone who was a fan of WABC in its Musicradio heyday. Click on the music note at left to visit that site. And of course, I wouldn’t complain too loudly if you went to iTunes and gave me a positive review. Even if that’s not your podcast catcher, every little bit helps. Click here for a transcript of this week’s show. This week, we’re taking a look at the Buckinghams, a Chicago-based group which had five big hits, all of which charted in a single year, after which they practically disappeared off the charts. For thirty years I harbored a suspicion that most of their hits were all about the same person, so I did a little research to find out what the story was. And, of course, the answer practically dropped into my lap. That said, I wouldn’t complain too loudly if you went to iTunes and gave me a positive review. Even if that’s not your podcast catcher, every little bit helps. Rock ‘n’ Roll Stories: James Holvay (KLCS-TV interview) https://vimeo.com/88115020, retrieved 8/6/17. This is a great interview piece. All Time Hits, WGN 1965, “Unchained Melody” https://www.youtube.com/watch?v=I90MXbMA-Xs posted by Museum of Broadcast Communications, Chicago and retrieved 8/6/17. http://www.rebeatmag.com/dennis-tufano-the-buckinghams-and-rocks-greatest-disappearing-act-part-1/ and http://www.rebeatmag.com/dennis-tufano-the-buckinghams-and-rocks-greatest-disappearing-act-part-2/, retrieved 8/6/17. The pieces don’t appear to link to one another, so you’ll probably have to come back here to get the other half. This is the sleeve for the Danish release of the record. 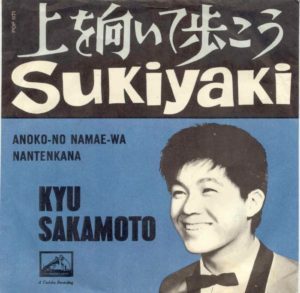 Whatever happened to Kyu Sakamoto, anyway? Incidentally, I recorded this show about two weeks ago, and I made a brief mention of the song “Despacito” by Luis Fonsi and Daddy Yankee. At that time it was pretty much the Song of the Summer, but according to Billboard Magazine, it’s reaching a new streaming record and about to tie with Mariah Carey & Boys II Men’s “One Sweet Day” for the Most Weeks at #1 on the Hot 100 (that’d be 15 weeks at Number One). If it remains #1 for another two weeks, it’ll be the sole record-holder. Get that story here. Most of the translation I got from this YouTube video. Some of it came from Songfacts.com, but this one seemed a little more reliable.